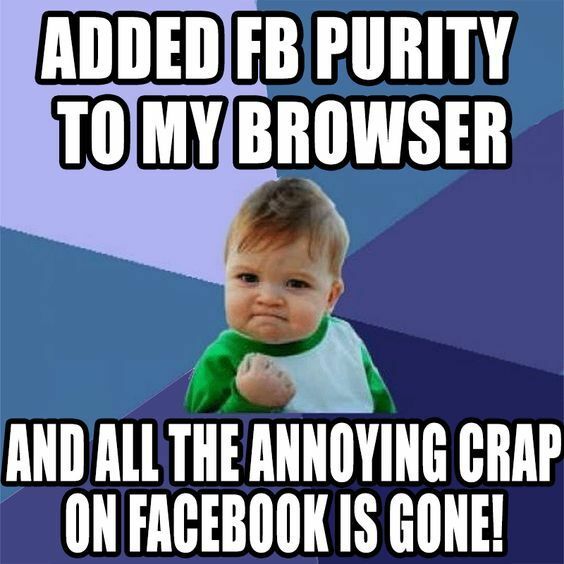 Added the safe, free and top rated FB Purity to my browser and all the annoying crap on Facebook is gone! Fixed “Live Grid” functionality on the “Live Video” page. Fixed Facebook are testing a new design for the Status Update box, where when you click in the box to start typing your status, the rest of the page goes dark. This version now fixes that, by changing the status box to how it was before. Install / Update the latest version of F.B. Purity by clicking the green “Install F.B. Purity” button on the F.B. Purity Install Page. This entry was posted in Facebook, FB Purity and tagged block pokemon go on facebook, block politics, bugfixes, clean up facebook, clean up facebooks newsfeed, Customize Facebook, FB Purity, FB Purity Update, FBP, FBP Update, fluff busting purity, hide clinton, hide pokemon, hide pokemon go on facebook, hide pokemon go posts, hide trump, newsfeed filter, newsfeed filtering. Bookmark the permalink. how can I take advantage of all these clean ups? Is there a “help” page? Yes there is indeed. Please read the F.B. Purity User Guide page to learn how FB Purity works. Help please. I left a message on another page. Thought it was the home. Trouble with this add-on I believe. Had to remove today and now my computer is working just fine. I would like to be able to use this but perhaps it was installed wrong? In Firefox on my Mac, I could not go to my usual bookmarked pages, or it took about five minutes to find the page, then I could not scroll but every 5 minutes or so! So disappointed. Had it installed for FB only. My husband did it in a hurry (he is a software expert), but maybe something went wrong. It worked fine yesterday. Can you help please? ALSO the biggest PUZZLE – WHEN I GOT BACK TO MY HOME PAGE THE SEARCH GOOGLE BOX AT THE TOP HAD A SEARCH I PERFORMED MONTHS AGO FOR A TV SHOW THAT WAS CANCELLED SO I KNOW I DID NOT SEARCH FOR IT FOR MONTHS???? THAT HAS NEVER HAPPENED BEFORE PURITY. I have the current version on FBP, but I can’t seem to get : Fundraisers sections. Any hints!? for more information, please re-read.